The children who participate in the JBay Recycling Project (JBRP), are now able to “buy” (exchange recyclables) dresses designed and made by Monica Zipper, fashion designer and twice winner of the British Designer of the Year award. This is something they have in common with the Princess Royal and Margaret Thatcher. Monica has been involved with the project since its inception in 2011. Together with Bernadette Bar, they have been the brains behind “Bernie’s Boutique”. This is the clothing section of the JBRP. 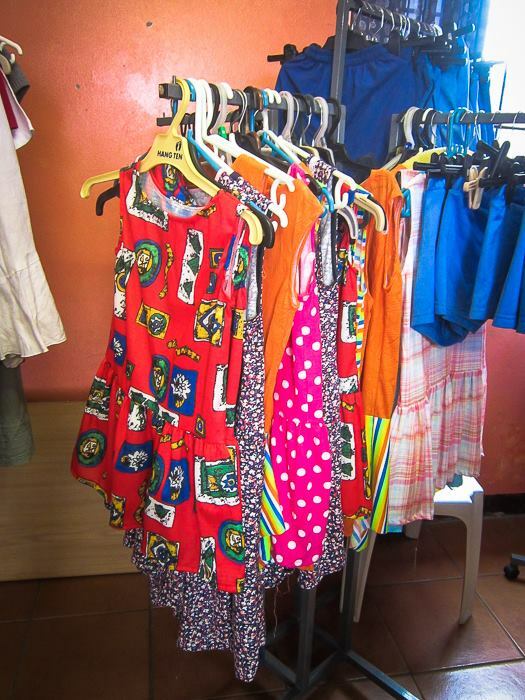 New and second hand clothing is available for the children to “buy” with their “mulas” in the Swop shop. Monica, Bernie and their helpers design and make dresses, track suits and t-shirts for the children who participate at the Project. They buy fabric for making the clothes from income generated from the quarterly Adult Sale/Fund raiser. Adult clothing and small household items are donated by members of the community and sold to raise funds. The next adult sale will be held on the 3rd of March, and donations are welcome. All children’s clothing, fabric and donations of money are always welcome to stock “Bernie’s Boutique”. (Bernie 083 2005618). Monica delivered 84 gorgeous dresses in January, and one can see from the little girls faces, that their newly bought dresses bring real pleasure. The children can also buy brand new School uniforms that were bought with money donated by the Jeffreys Bay Wind Farm. A big thank you to the Catholic Church of St Clare of Assisi in Jeffrey’s Bay for donating money specifically for buying fabric. February 27, 2017 in recycling.